Please join us on the roads of beautiful Yorba Linda, California as we come together to honor the service and sacrifice of our hometown heroes, United States Marines; Lance Corporal Rick Centanni and Sergeant Major Robert “RJ” Cottle. The 2017 Centanni-Cottle Memorial 5K winds 3.1 miles through Rick and Robert’s hometown of Yorba Linda, California. The 5k route passes by all three schools Rick attended, starting just south of Fairmont Elementary and continues south down Fairmont Boulevard past Bernardo Yorba Middle School then west on Esperanza Road and finally north on Kellog Drive ending at Esperanza High School. Proceeds benefit the Rick Centanni Memorial Fund, Kaila Cottle Trust in memory of her father SgtMaj Robert J. Cottle, Semper Fi Fund, Wounded Warrior Project, The American Legion and Fisher House. For more information please go to our 5K page. 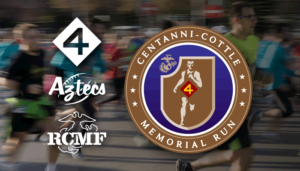 6th Annual Centanni-Cottle Memorial 5K Run/Walk – 3/25/2018! The LCpl Rick Centanni Memorial Scholarship is open to any Esperanza High School Senior student/athlete with plans to attend a university, college, vocational or trade school. The $1000 scholarship award is presented annually to one male and female student/athlete that meets the scholarship criteria outlined by the RCMF and Esperanza High School faculty. Additionally, the RCMF assists similar organizations with support and donations. The RCMF is a non-profit organization (Tax ID #27-2617352) per 26 USC § 501(c)3.